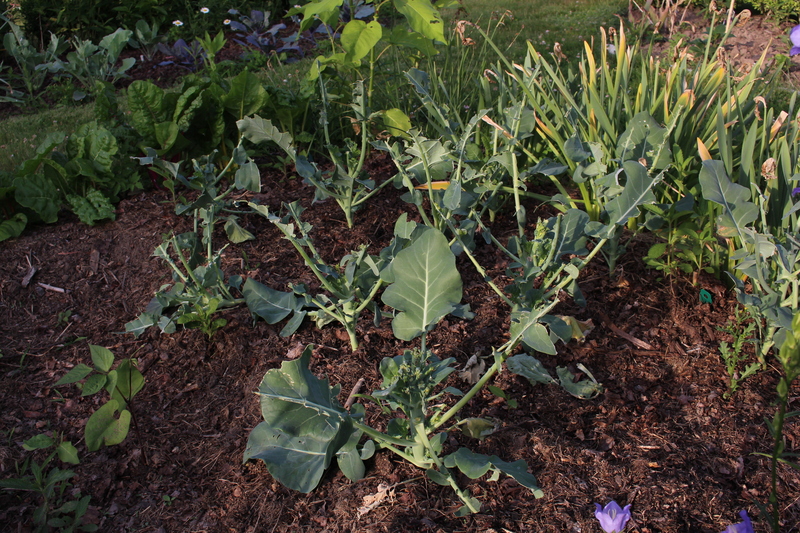 Last week the usual garden inspection turned up a massacre in the broccoli patch. My luck had run out and the rabbits had finally found the tender lettuce and cole crops… just when they were finally settling in. All the tender lush growth from the cool, damp weather has been nipped back, and I’m left with these leafless stalks. 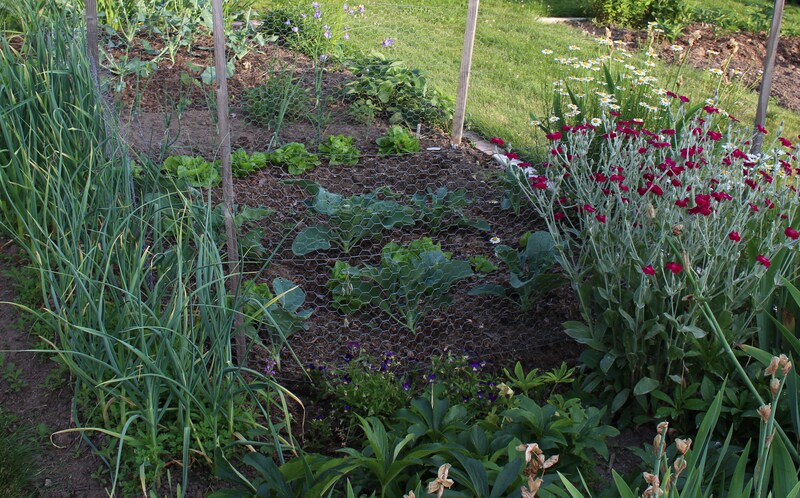 The day before yesterday would have been the perfect time to fence off the vegetable garden…. What a setback! Of course it’s my own fault since even with the local stray cats, rabbits are still in and out of the garden, but I like to think the bunnies won’t take advantage of me and a nibble here and there is no big deal….. so I didn’t bother with a fence. That of course changed, and the fence is up again. A little chicken wire to keep the bunnies out. Rabbits around here tend to be lazy, so a weak fence or even a few brushy twigs will keep them off my delicious ‘Matina Sweet’ lettuce. Something was different though. The onslaught of damage was pretty severe for a stray rabbit finding a tender bit of broccoli, and the lettuce and cauliflower were also sampled. That’s a lot of nibbling for one or two rabbits on one or two nights. I began to wonder if a groundhog had returned….. a little plant leveling, bulldozing, little garden pig, who eats everything in sight…. but no, the damage wasn’t that bad. I found my answer the next morning. Two young bucks were on the other side of the fence plotting their return. I knew they were around -three weeks ago a doe bounded over the fence while the kids and I were playing back there- but now I know they’re moving in. Deer are something I don’t want. Where are all the hunters when you need them? Figures they would go straight for the broccoli and lettuce, they’re two of the only vegetables I actually eat. Why couldn’t they start with the chard? Rumor has it vegetables make for healthy eating. I like to think of these unpicked and uneaten ‘bright lights’ swiss chard as being good food for the soul. We’re not exactly country around here, but we do have our share of wildlife drama. Snakes and toads come and go, bugs abound, and all kinds of birds stop by to eat and drink and sometimes set up house. I finally found the tiny field sparrow nest (or at least I think that’s what they are) in the small blue spruce by the sandbox. Two chicks have hatched and it amuses me that they spring to life begging for food the second I tap the nest. I’m not a good nest finder, and the only reason I found this one (after three tries -and the spruce is barely three feet around!) is that I noticed a female cowbird staking out the bush. Cowbirds will sneak in and remove an egg from an unguarded nest and replace it with one of their own, and this is what they did here. When I found the nest there were two white speckled eggs alongside the three blue speckled. I may or may not have removed the cowbird eggs. Cowbirds are a native species and as such are protected under the Migratory Bird Act, so tampering with their eggs would be illegal…. but I also may at times roll through stop signs and push the speed limit, so I’m not sure where this puts me on the spectrum of criminal activity. All I’ll add is that cowbird chicks will usually outgrow their nestmates and end up displacing them, so I’m glad these parents won’t be stuffing food into a chick which grows to be twice their size. Another thing which borders on illegal is the number of weeds and out of control plantings in this wanna-be iris border. 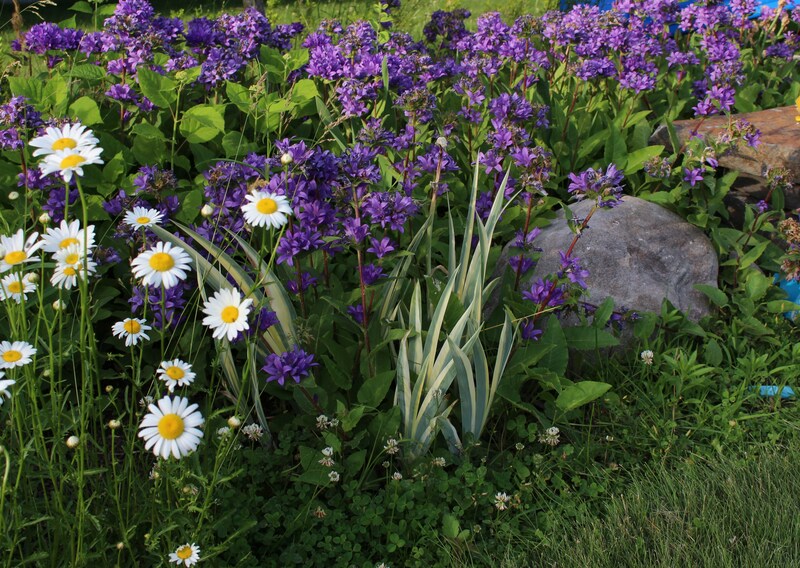 It’s almost criminal how the campanula took over and the daisies moved in…. not to mention the clover. Still on the to-do list is the iris bed. I think it needs a complete overhaul to get rid of the beautiful purple campanula glomerata which has taken over. The only legitimate planting here is the yellow variegated iris which is still just barely hanging on. All in due time they say, but I suspect due time might have passed along with the summer solstice. Instead of humming along, the garden is still taking form. Someday I hope to have things together but I suspect I just might not be that kind of gardener. It would help if a simple planting up of the deck pots didn’t turn into a table refinishing, light fixture replacing, porch chair repainting, trim rebuilding… .kind of project, but such is life! 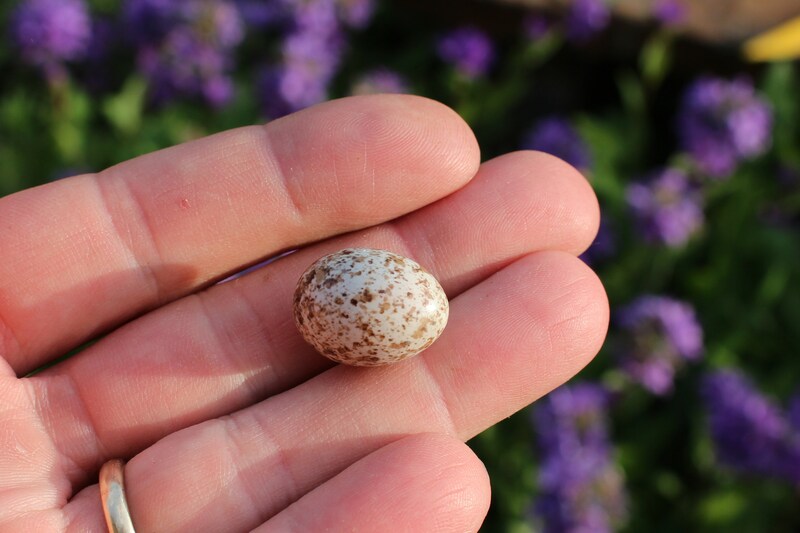 This entry was posted in birds in the garden, early summer, garden, perennials, Uncategorized, wildlife and tagged campanula glomerata, cowbird egg, cowbirds, deer damage, garden, gardening with wildlife, swiss chard 'bright lights'. ← All work and no play…. I had Campanula glomerata ‘Joan Elliot’ at our old house and it never took off like yours has. I always had to coddle it along. 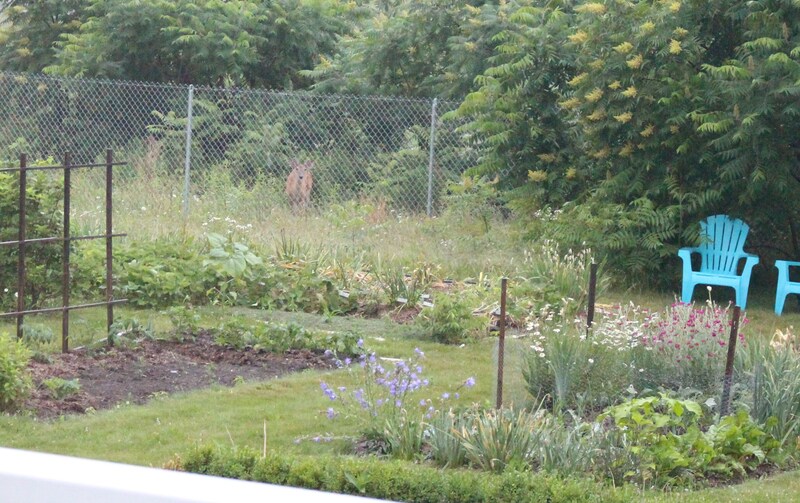 Also at our old house, the deer seemed partial to broccoli. Seemed like it was the first thing they went after. Good luck keeping them out. No returning deer (yet). Maybe they’ve moved on to bigger and better things? Who am I kidding, I know they will strike when least expected, such as right when the phlox is about to bloom…. I’ve heard campanula g. cultivars are safer than the species, and I have to confess the person who gave it to me gave a warning along with it! I’m always surprised by how much goes on in the garden when we’re not looking! There’s a whole life and death drama which plays out every night. Deer are a character I wouldn’t mind keeping out though. The fence is intended to keep us in our yard, away from the industrial park, and not as much for keeping wildlife out. It’s about six feet (1.8m?) but I think if our deer can see the path is clear, they will make the jump. Maybe some shrubbery along the fence wouldn’t be the worst idea. I think the cuckoos are similar, but much more charismatic than our drab little, untuned home wreckers. We have the common garter snakes here, and I’m convinced it’s only one snake which I keep seeing again and again! Good to know I am not the only procrastinating gardener! Things have just slowly pasted me by. My favorite saying is, “there’s always next year” Enjoy your summer! Enjoy my summer I will! I find it’s much easier to deal with a little weeders guilt than it is to run yourself ragged doing something which should fall into the ‘fun’ category! Oh no, rabbits are bad enough, but deer! What will you do, will you increase the height of your fence? The damage for now seems to have stopped, so fingers are crossed, but if it picks up again I plan on pulling out the netting first and if that’s not enough, spray some deer repellent. Deer are tough to deal with. Sorry they went right for your favorites. Nice rose campion by the way–I need to pick up some seeds. All my red campion died out and I’m left with lots of white. If you can keep such a nice garden with your local deer, then I have hope for mine since maybe this will only be a once or twice a year thing. If your red campion doesn’t show up again, let me know and I’ll get some seed for you! I rather like the Campanula bed, with or without the irises! Deer and rabbits are luckily something we don’t need to worry about, but I can sympathize about your veg… I wouldn’t even attempt to grow any in the ground with the snails and slugs we have! 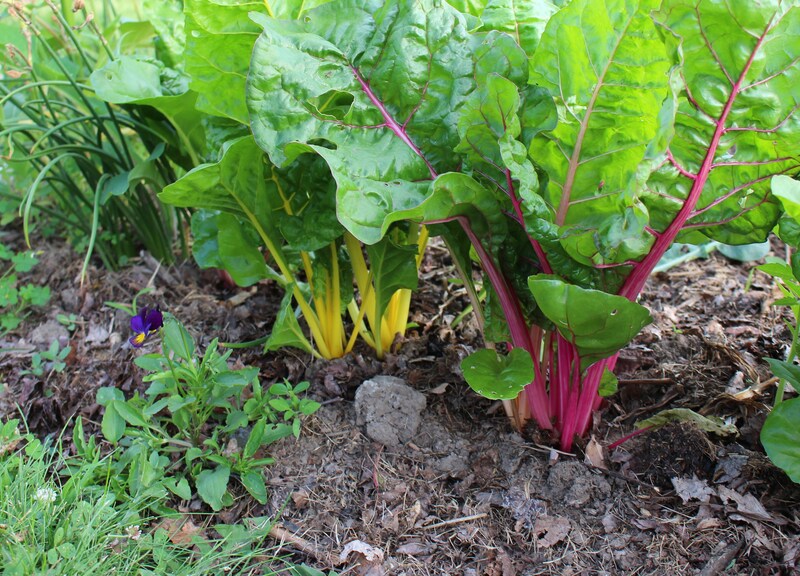 Your chard is looking really healthy compared to mine in a container. It obviously likes deep soil. A few weeks ago I realized I’d never get everything done I intended to, and adopted the motto “what I don’t do today, I’ll do tomorrow”. 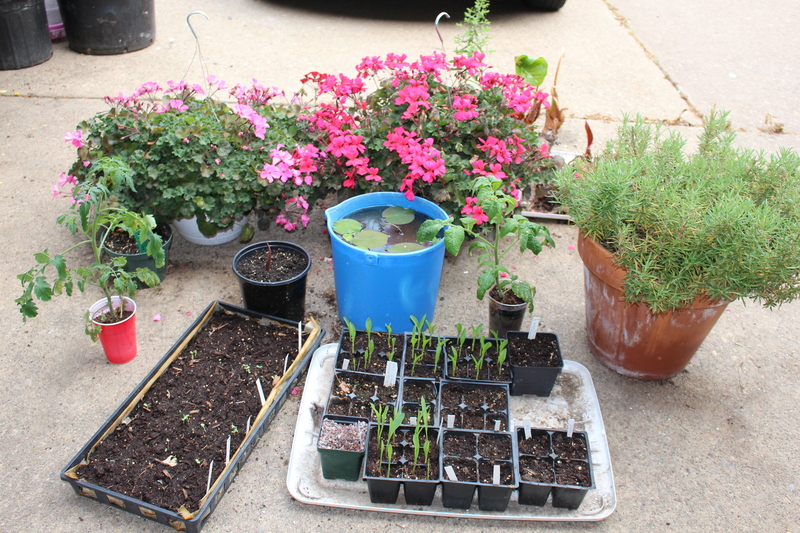 It eases my conscience… It’s also a comfort I’m not the only one seeing time fly by before gardening jobs get done! Happy summer Frank! You know this seems to be a bad year for clover. Gardens up here are rampant with it. You find of the nest was a good catch. Seeing the cowbird a great clue. Don’t they just leave an egg and go though? Maybe you almost caught her in the act. 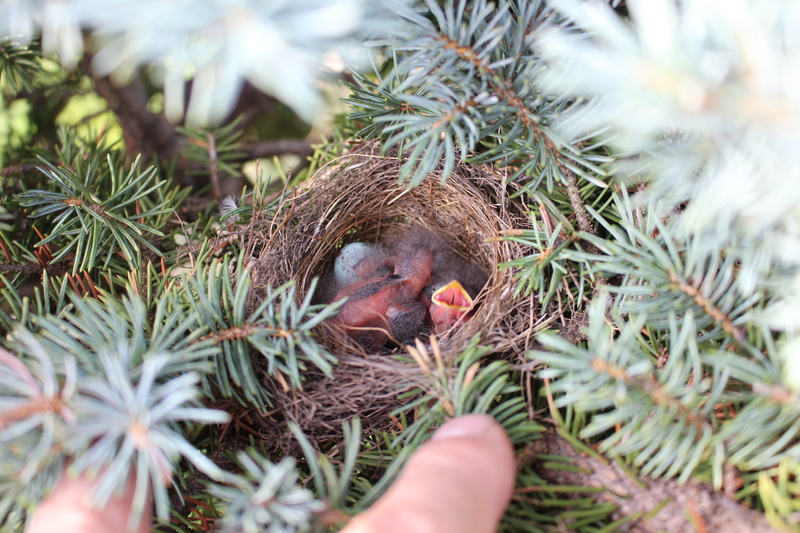 I tried looking into the cowbird thing and it sounds like a female will remove an egg and replace it with her own… and usually only one, so it’s likely two birds visited ‘my’ nest to drop their child off. Clover is one of my most annoying weeds. I don’t really mind it, but it’s relentless in the way it creeps right back after being removed… I have much worse weeds but clover just keeps coming again and again! You may be a self-proclaimed procrastinator and late starter this year, Frank, but looking at your vegetables I feel really guilty that mine are only just peeping through the soil. If only the rabbits would let them grow a bit, I might feel happier. Thank you for your nice comment on my blog. I am so glad you visited because now I found yours which I love! I am wondering which part of NEPA? Not my area of the Poconos obviously, as you don’t mention black bears among the criminal elements in your garden. Haha, thanks for the procrastinating support! I don’t miss the bears, now and then they wander on into town, but it’s still few and far between. Im glad you stopped by, I’ve been enjoying your blog for a few months now and it’s nice to hear from a neighbor. I’m down in the valley, just south of Scranton. Oh dear! Deer! We gardeners are a stubborn breed. We are plagued by such a variety of beasts determined to ruin our gardens and eat our produce and yet we persevere. It’ s pigeons with me, hordes of greedy pigeons. And when they are not eating my brassicas and excreting revolting amounts of mess, they are misbehaving in every tree in a way that makes me glad there are no children in the garden to be corrupted by their licentiousness. I’ ve never heard of cowbirds, you do have exotic wildlife. I am very grateful that I don’t have to deal with deer. Rabbits and skunks are the biggest problem. In terms of the cowbird eggs – I didn’t see no cowbird eggs. I didn’t see nuthin’. Two little sparrows left the nest this weekend, I felt slightly responsible for their chance at life… they sure do grow fast!